Life has been brought into the clock tower. 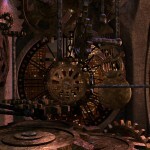 Each gear of the clock movement mechanism has been animated to make the clock a working beauty. The animation went very smoothly since everything was set up neat and clean. 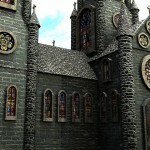 The rendering took four days across two computers. Compositing took one full day. The clock tower can be viewed on either Youtube or HQ Download (68mb).